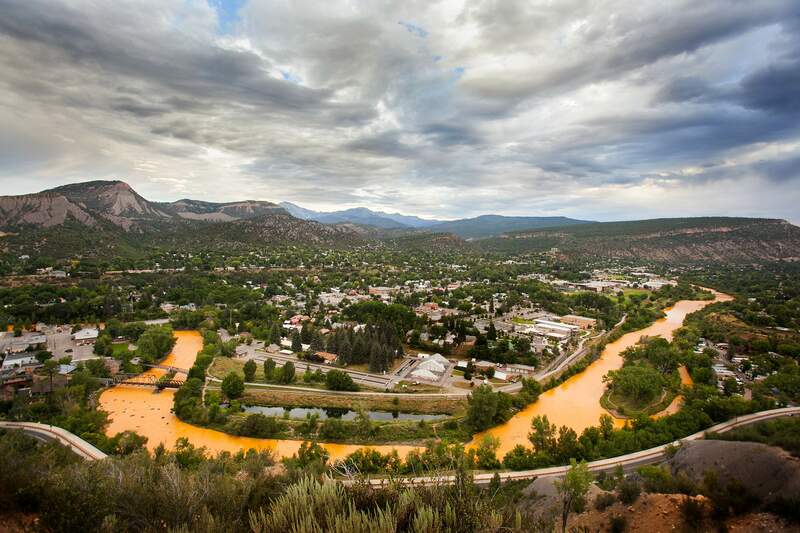 Dawn breaks over Durango on Aug. 7, 2015, revealing the orange sludge in the Animas River after it was contaminated by Gold King Mine wastewater two days earlier. Water flows through a series of retention ponds built to contain and filter out heavy metals and chemicals from runoff coming from the Gold King Mine, north of Silverton. The Environmental Protection Agency funded a temporary water-treatment plant at the mine, eliminating the need for the retention ponds. 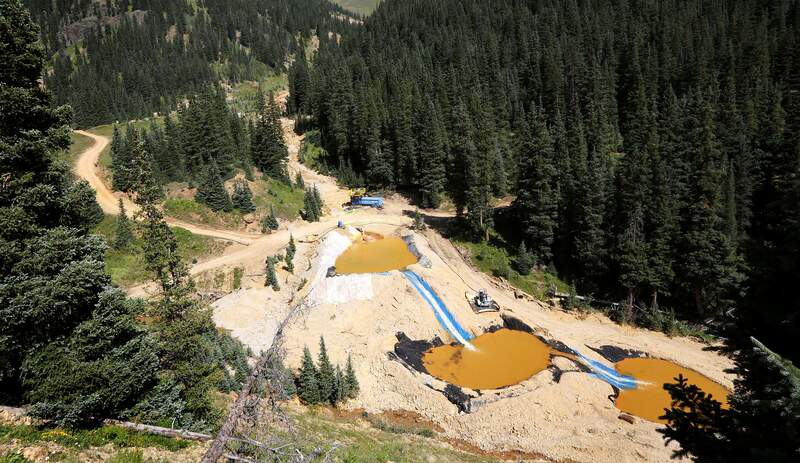 The Gold King Mine blowout six months ago that dumped 3 million gallons of orange sludge into western waterways spurred action that could lead to remedies for the long-standing problem of toxic drainage from thousands of abandoned mines. A flurry of bills has been introduced in Congress, and Colorado Gov. John Hickenlooper established a task force to identify priorities for restoring inactive mines across the state. But it’s not a small problem, and there are no quick solutions. There are an estimated 23,000 inactive mines across Colorado – many of which are leaking – and about 1,645 miles of stream potentially impacted by mining. Regionally, there are 161,000 abandoned hardrock mines across 12 western states and Alaska, and at least 33,000 are reportedly leaking contaminants. Bennet, a Democrat, and Republicans Sen. Cory Gardner and Rep. Scott Tipton have crafted Good Samaritan legislation that would provide liability protection for third-party groups to pursue mine cleanup efforts. Although their legislative efforts preceded the mine spill, the fallout has renewed attention on the need to remediate abandoned mines. “This is something that I’ve been supportive of for as long as I’ve been in public office, but this certainly gives it a stronger impetus and perhaps momentum to finally finish the job,” Gardner said. Last month, Hickenlooper unveiled the Mining Impacted Streams Task Force, which includes state water, mining and salt and hazardous waste officials, as well as federal agencies. The goal is to identify gaps in data by pooling resources from the Water Quality Control Division, Colorado Division of Reclamation Mining and Safety, U.S. Forest Service, U.S. Bureau of Land Management and tribal entities, among others. Researchers will look at water-quality data going back 30 years to take a full watershed approach, examining water from the Upper Animas River Basin to Lake Powell. Hickenlooper wants to turn disaster into action, pointing to the resiliency of the Durango community. Hickenlooper wants the task force also to identify new technologies that could assist with reclamation efforts. “We’re looking at what are some out-of-the-box ideas on how you address mines like this, mines that show some great risk,” the governor said. Having data and identifying priorities to tackle the inactive mines also provide ammunition for getting federal help, including possible Superfund listings for sites across the state and encouraging Congress to pass “Good Samaritan” legislation. Tipton proposed Good Samaritan legislation in 2013 and has long advocated for some liability protections for third-party groups willing and able to undertake cleanups at abandoned mines. “We believe that with good, appropriate Good Samaritan legislation that we can actually achieve that goal and we hope that we’ll be able to find that good common ground – sensible common ground – to do what we would all like to have done, and that’s to be able to clean up these areas,” Tipton said. Patrick Pfaltzgraff, director of the Colorado Water Quality Control Division, said the new state task force and other efforts will allow the long-standing problems to be addressed. “There’s a bunch of different impacts throughout the state in the mining district that we’re going to have to look at and try and get our arms around,” Pfaltzgraff said. The Bureau of Land Management estimates nearly 500,000 abandoned mines across the U.S.
A 2011 Government Accountability Office analysis found: Of roughly 161,000 abandoned hardrock mines across the 12 western states and Alaska, at least 33,000 were reportedly leaking contaminants into nearby lands and waterways. The Environmental Protection Agency estimates 40 percent of western waterways are impacted by acid mine drainage. Estimated cost to remediate these mines is $36 billion to $72 billion. Colorado Division of Reclamation Mining and Safety estimates 23,000 abandoned mine sites in the state. Of these, the BLM reports more than 2,700 mines are on public lands. Colorado health officials report leakage from 230 identified abandoned mines has contaminated about 1,645 miles of state waterways.